FQB "Hear Me Roar" Collection ushers in a plethora of animals, tropical leaves and florals that will have you thinking about your next creative adventure! 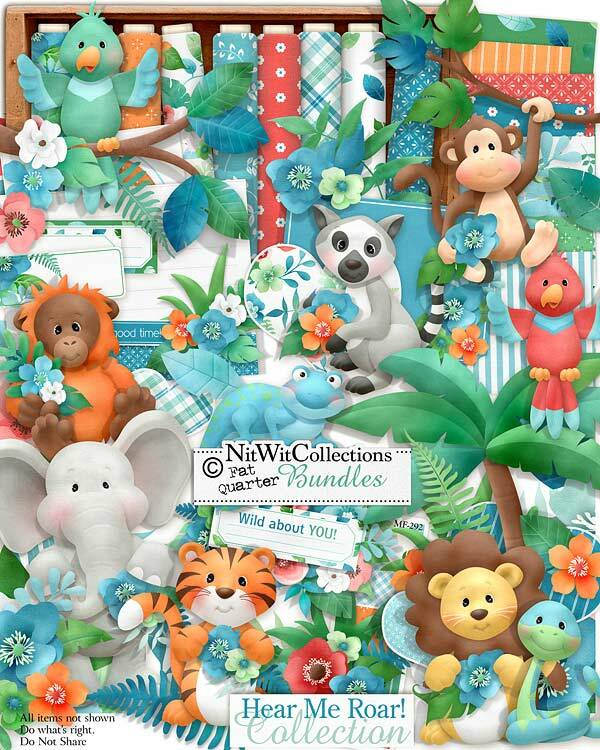 The adorable animals in this kit certainly will warm your heart and give you all kinds of inspiration for your cards, mini albums and scrapbook layouts.....but don't miss out on the other side to this digital kit! The flowers and leaves as well as many of the background papers are the perfect combination for vacation photos, thank you creations, birthdays and more! Feast your eyes on this fabulous kit and you will be awash in creativity!! 1 Elephant who will charm any card, mini album or scrapbook layout! 9 Flowers in several varying colours and shapes to give you such wonderful creative opportunities!! 1 Flower cluster with a word tag - "Wild About You"
2 Grass clusters to place where you find is the perfect spot! 1 Journal square with loads of blank space to add in a photo, a journal area or embellish with elements from this kit! 1 Label - "Wild About You"